“Those were the days.” It’s a phrase adults often find themselves saying when they see a kid being, well, a kid. Childhood is an idyllic life stage for a reason—without the responsibilities, worries, and expectations of adulthood, there’s not much to be unhappy about. That doesn't mean, however, that grownups can’t learn a thing or two from their younger counterparts on how to live a more blissful existence. Here, a handful of reasons why thinking more like a kid can change your life for the better. If you’ve ever watched a kid sing or dance in public, it’s clear they have no inhibitions. As people age, however, they constrict themselves to certain behaviors, with more concern toward perception. In 2014, neuroscientists studied the brains of jazz musicians and found that when they improvise, they turn off an area of their brains connected to self-censorship. You may have to get in the habit of doing so, but lowering these barriers and letting yourself seize the moment—in other words, approaching a task more like an unencumbered child would—can be highly productive. 2. … AND THEY LET THEIR MINDS WANDER. Give a child a cardboard box, and you’ll get hours of uninterrupted make-believe fun. 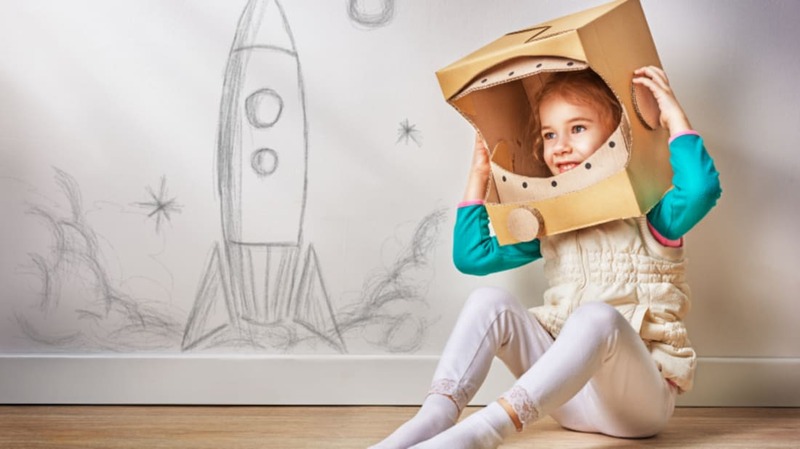 By letting their imaginations run wild, kids exhibit true creativity. Thankfully, adults can do the same—and they don’t even need a particular talent, some researchers say— as long as they’re open to a new experience and can stick to the task at hand. Fun fact: it works in reverse, too. Just as much as being creative gives people a greater sense of purpose and leads to overall life satisfaction, being happy helps people to be more curious, expressive, and ultimately creative. 3. THEY SAY WHAT THEY MEAN. Kids are honest … to a fault. They’ll tell you if they don’t like your shirt, if the food you cooked is “yucky,” or if that story you are telling is boring. Meanwhile, adults tend to tell white lies—an average of 11 per week—to save another’s feelings or avoid awkward interactions. University researchers, following a 10-week polygraph-based experiment in 2012, found that those who told fewer lies reported improvements in their close personal relationships. How to avoid mistruths? Stop making false excuses, answering a troubling question with another question, laughing off uncomfortable conversations, or simply changing the subject, and address the tough stuff head on. Your relationships will be stronger for it. 4. THEY AREN'T AFRAID TO CRY. Turns out, being a crybaby is a good thing. Following more than 15 years of study, tear researchers have discovered that crying is not only a human response to frustration or sorrow, but it’s also a healthy one. Crying lowers blood pressure and decreases the amount of stress hormones present in the body. Before you put on a stoic exterior, remember that waterworks actually work wonders. 5. THEY DON’T HOLD GRUDGES. It’s not often you see a boy refuse to play kickball with another kid because a month ago, that kid tapped him— twice!—in a game of tag. Children have short memories and it pays off: Canadian researchers concluded that constant bitterness can actually make a person sick and deteriorate quality of life. If grownups can let go of resentment and regret—negative emotions rarely seen in youth—they’ll see improvements not just in mental wellbeing but in their physical health as well. 6. THEY EXUDE BLIND OPTIMISM. Babies seem to come out of the womb with limitless potential, and most kids are fearless, unbothered by external restrictions. For those seeking happiness, a longitudinal study confirms that expressing optimism, the way a child would, is key. In fact, this type of positive thinking, in which good events are seen as self-made and bad experiences as transient, is also associated with a longer life. Ask a kid what they want to do right now, and they’ll shout the first thing that comes to mind, whether it’s to ride their bike, go to outer space, or pet a rabbit. It might not make sense, sure, but when faced with an abundance of options, they weren’t paralyzed with indecision. Nowadays, committing to a simple choice can be debilitating … and a common roadblock to happiness. Based on a pyschology researcher’s findings, “satisficers”—those who opt to make a good-enough choice rather than agonize over what the “best” one is—have less anxiety and more emotional stability than “maximizers” who weigh every possibility thoroughly before coming to a conclusion. 8. THEY SEEK OUT NEW EXPERIENCES. Kids don’t worry about coloring in between the lines, and they’re often eager to play new games or meet new friends. In short, they are novelty-seekers, a character trait that drops by half throughout adulthood. According to a recent university-developed personality test, how much a person values novel experiences is a crucial predictor of well-being.